2018 Update: We still stand by this advice on how to set up the best home office for working moms and dads — but you may want to check out our more recent discussion on mistakes to avoid when working from home. If working from home is a regular thing, get childcare. I don’t know about you, but when I am focused on my job I am 100% focused. My kids could be throwing the wedding china off the roof and I wouldn’t notice… which isn’t the best for, well, anyone. With a really little baby you can sort of multitask since they sleep so much (and you can trap them in the Exersaucer/swing, hehe), but once they get to that crawling-walking-HEY-WHY-ISN’T-MOMMY-100%-FOCUSED-ON-ME stage, you need at least a mother’s helper, but probably a babysitter or local daycare. (You may ask, “But why even bother working from home if I still have to get childcare?” If your commute is 30 minutes, you gain an hour every workday; you can be more flexible when your kiddo is sick or when your partner suddenly has to work late; and you can even fit in a few personal tasks during the day, like throwing a load of laundry in, starting water boiling for dinner, etc. 2018 Update: OK and fine here’s a link to BBC Dad which is always great to think about if you’ll be on any video calls. Have a dedicated space that you can close up when you’re done. 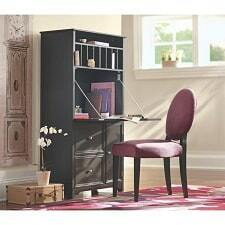 Whether it’s a room with a door or a secretary desk or other hutch with a door, this is a must for your home office. Not only does it keep your kiddo (and nanny) away from your computer and papers, but it can help you get into and out of “work mode” — seeing that the room or desk is closed can help you relax and unwind in a way you can’t otherwise. Plus, you will be amazed at the damage your kiddo can do to your computer (I’m told cats are the same) — H, my 2.5-year-old who’s in that phase where he loves to bang on things, has changed passwords (on the start screen! ), inverted the monitor display, and more. Yaaaaaay. A system to keep your work files separate from your family files, both physically and on the computer. The temptation to organize family pictures or pay the bills when you should be working can be… strong. Things that are discrete tasks (paying the insurance bill) can be fine, as long as they don’t turn into a massive procrastination project. (LOOK how disorganized my files are! I must fix this right now!) I use a tray organizer to keep work and family stuff separate. A solid Internet connection. Note that in my experience, you can upgrade to “business-level service” for your Internet for just $10-$25 more a month. A good monitor (or two — I’m loving the multiple monitor thing at the moment). A printer and scanner. I prefer to edit on paper and print a ton of things, and I still use my scanner often. A nod to ergonomics. The $179 chair I have at my desk is ugly, but well-reviewed as an affordable chair for the home office. I also use a footrest beneath my desk to try to resist the lure of sitting on my feet, and my keyboard and mouse are both ergonomically friendly. 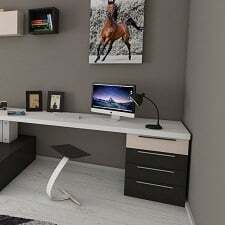 For those of you who work at home, what else do you keep in your home office? Any particular products you swear by, or techniques or tactics that help you keep things separate? What are YOUR best tips on how to set up the best home office for working moms and dads? 1) A room with a door you can close. 5) Good communication solution. I find a cordless phone works the best but your office might have a VoIP setup. 8) Definitely childcare and an area they can play away from you. Otherwise you will get nothing done and look bad. In an emergency – give them a video to watch while you are on a call. 10) Make sure you have a way to transfer to-do lists between work and home. 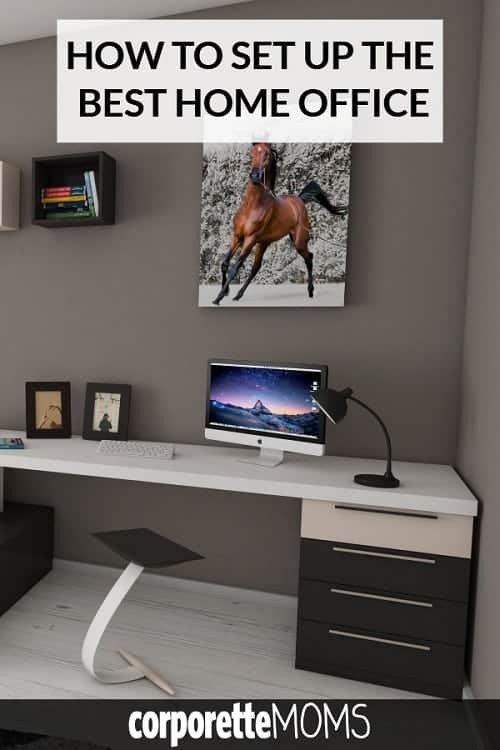 Is that desk an actual product or is this a photo from pinterest situation? WHERE IS NEV FROM CATFISH? i need a reverse google image search! I am now working from home about 40% of the time, so this is very timely as I am working on setting up my home office. I would love suggestions on scanners. I also edit a lot on paper, and when you are scanning 100 page contracts, you need something that can scan quickly. Ideally, I would love something that could scan double-sided docs. Any recs? I have the Epson Workforce 3460, ordered from Amazon. I’m an attorney working from home, scanning lots of docs, and printing lots of docs. It’s not the perfect machine, but it costs only $115 on Amazon right now and was only a $100 when I bought it. It can scan and print double sided. It has an automatic feeder on top for scanning or copying many pages (including double sided), but only about 40 pages will fit in at once. It is a wireless printer, but you can also plug it directly into your computer or scan to a flash drive, which I recommend when trying to scan and send 40 double-sided pages at once, as it sometimes fails to transmit such large files (not sure if this is a printer problem or because of my internet connection). 2 big cons: My first printer started printing fuzzy and I was unable to fix it right after the 1 year warranty ran out; I ended up ordering another just like it because for $100, it saved me the hassle of looking around and everything similar was much more expensive. Also, the black, red, blue, and yellow ink all come in separate cartridges, but if one cartridge runs out you cannot print in any color or black until the empty one is replaced – this is a huge hassle when I run out of the yellow that I never use and am, therefore, not able to print a black and white document. I have learned to keep extra ink in all colors on hand.